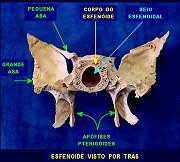 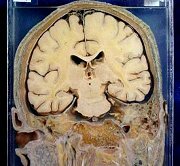 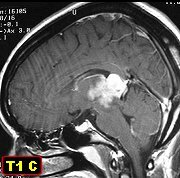 Additions posted 2007 - 2008 ..
M. 42 yr. Chondroma of skull base at petrous apex / cavernous sinus Same, HE, IH, text F. 67 yr. Necrotic cysticercus cellulosae of cerebral hemisphere - reactional changes in brain tissue Same, specimen, HE. 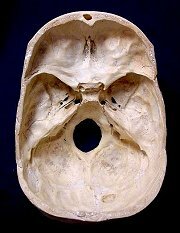 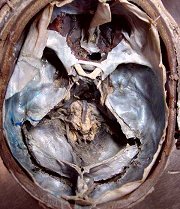 Skull base with dura mater and cranial nerve roots Axial sections of intact head, brain in situ. 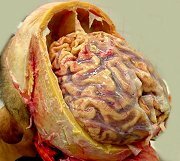 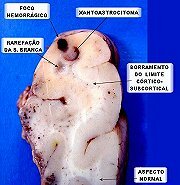 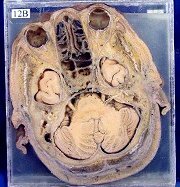 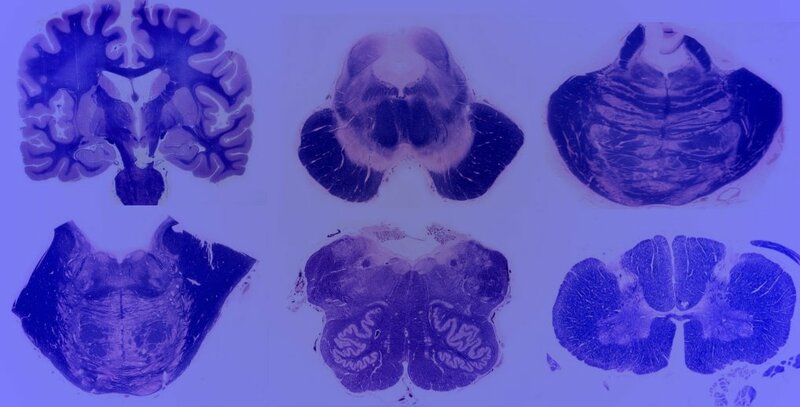 Coronal sections of intact head, brain in situ. 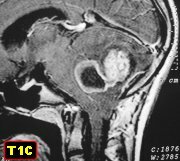 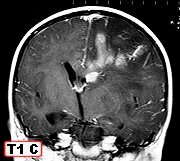 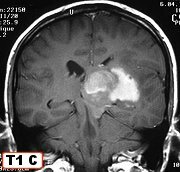 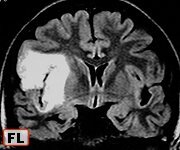 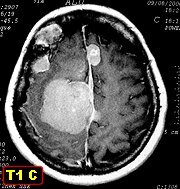 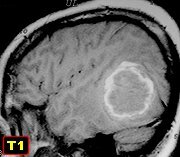 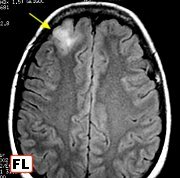 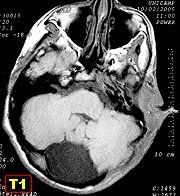 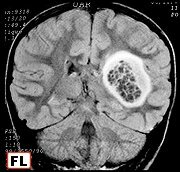 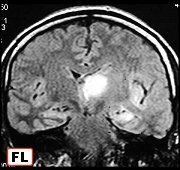 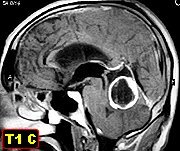 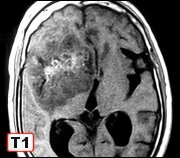 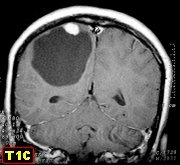 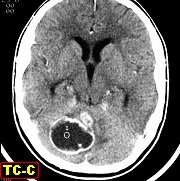 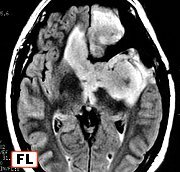 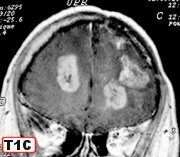 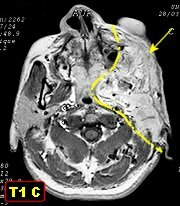 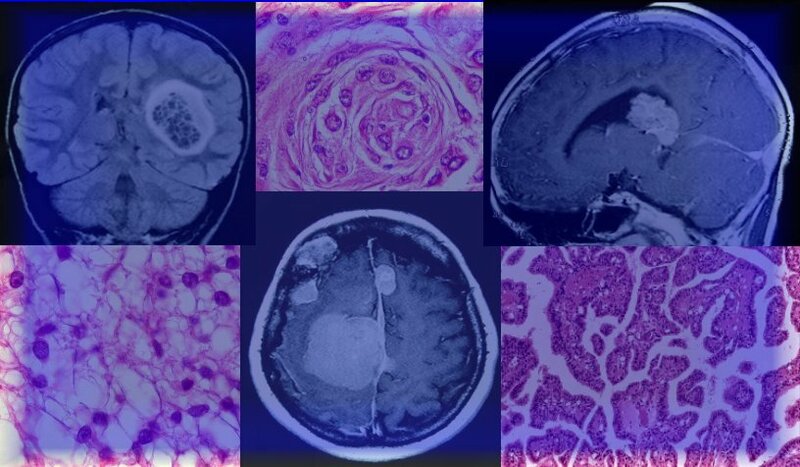 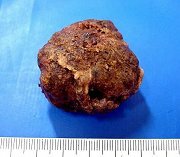 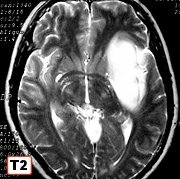 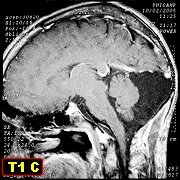 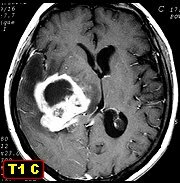 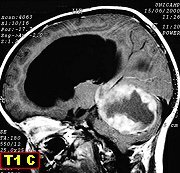 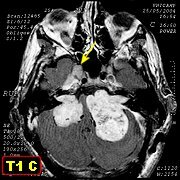 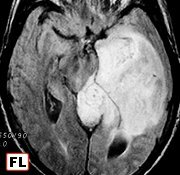 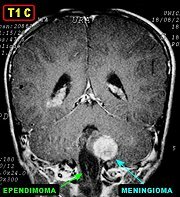 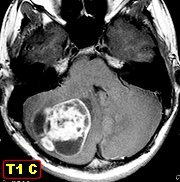 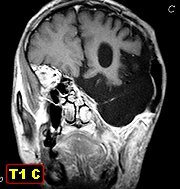 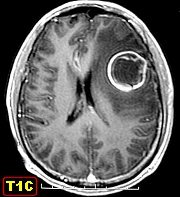 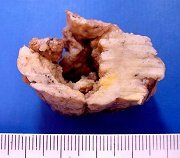 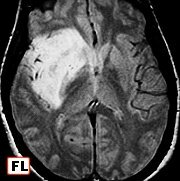 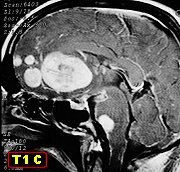 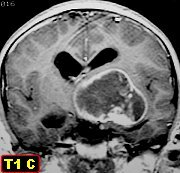 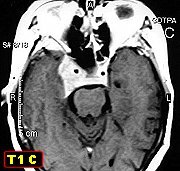 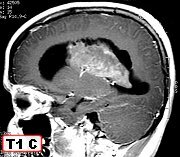 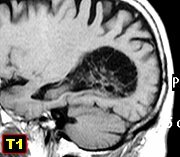 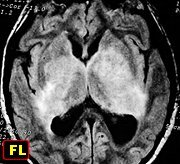 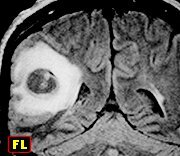 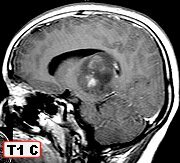 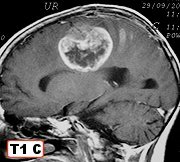 Anaplastic oligoastrocytoma - radiation brain necrosis after 5 years. 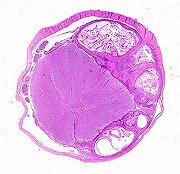 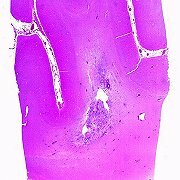 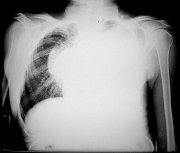 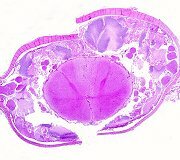 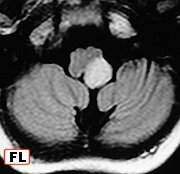 F. 50 yr. Sturge-Weber syndrome. 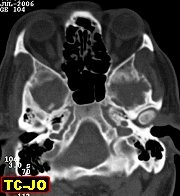 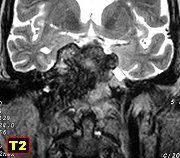 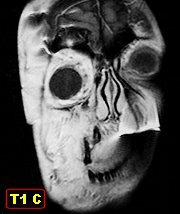 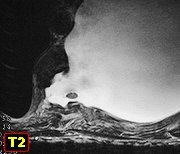 Calcifications in plain skull X-ray films M. 12 yr. Sturge-Weber syndrome. 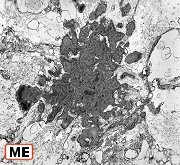 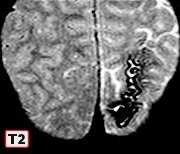 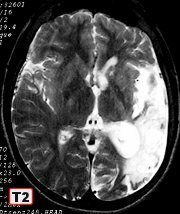 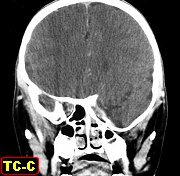 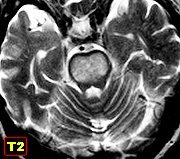 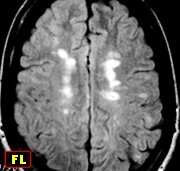 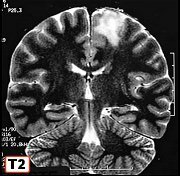 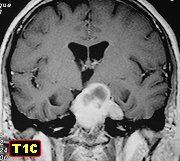 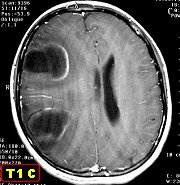 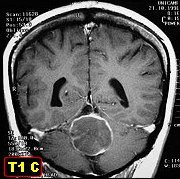 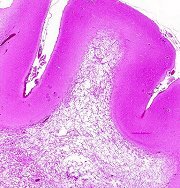 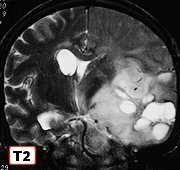 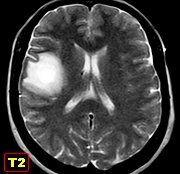 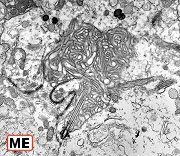 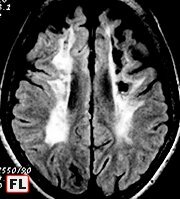 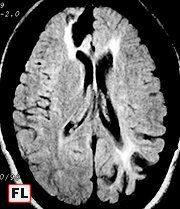 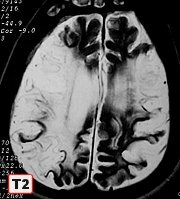 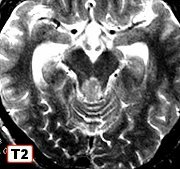 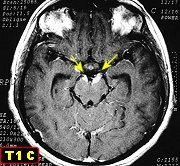 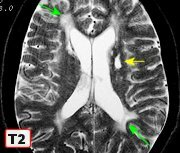 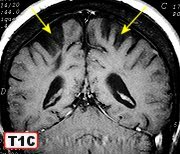 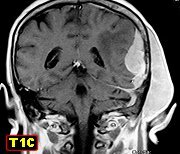 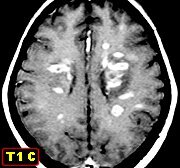 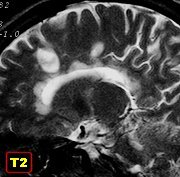 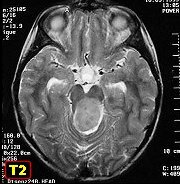 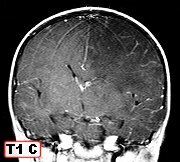 Cortical calcifications showing as bands of low signal intensity in T2 WI M. 1 yr 9 m. Sturge- Weber syndrome. 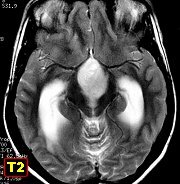 Contrast enhancement of cortical angiomas and choroid plexus in left hemisphere. 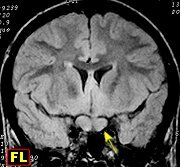 F. 12 yr. NF1. 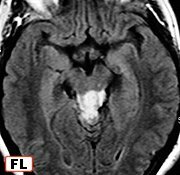 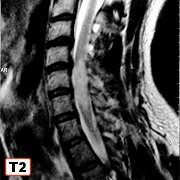 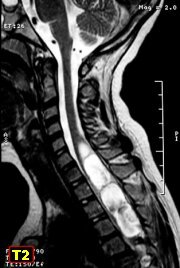 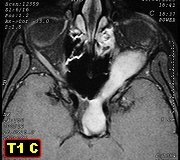 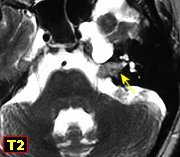 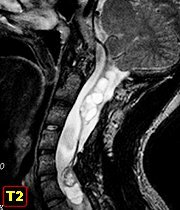 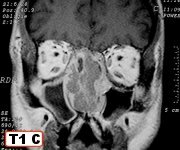 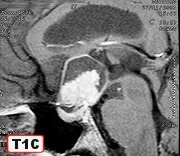 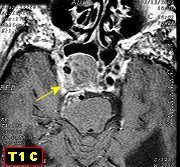 Sphenoid dysplasia, neurofibromas of orbit and scalp, enlarged cisterna magna, foci of abnormal signal intensity in cerebellar vermis and globus pallidus M. 14 yr. NF1. 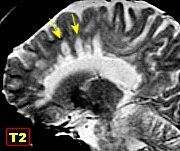 Multiple foci of abnormal signal intensity ('hamartomas') in brain. 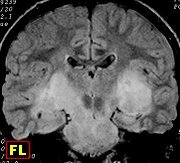 M. 30 yr. NF1. 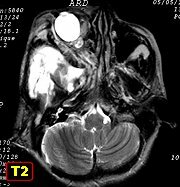 Plexiform neurofibroma, sphenoid dysplasia, middle fossa arachnoid cyst, craniofacial deformity F. 24 yr. NF1. 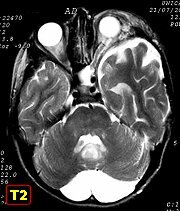 Plexiform neurofibroma of face and scalp, sphenoid dysplasia, middle fossa arachnoid cyst, craniofacial deformity, proptosis and buphthalmos. 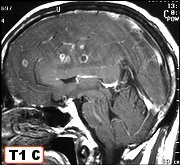 M. 13 yr. NF1. 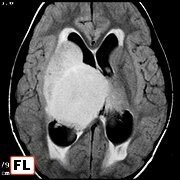 Plexiform neurofibroma of scalp and ear, posterior fossa arachnoid cyst M. 17 yr. NF1. 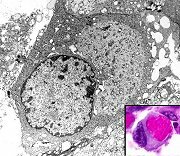 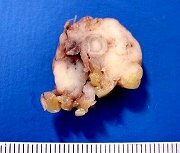 Plexiform neurofibroma of nuchal region with malignant transformation (malignant peripheral nerve sheath tumor, MPNST). 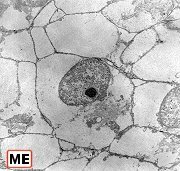 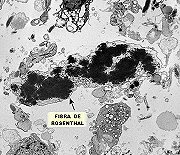 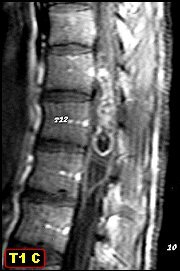 M. 66 yr. NF1. 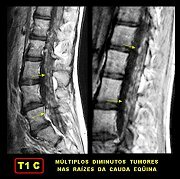 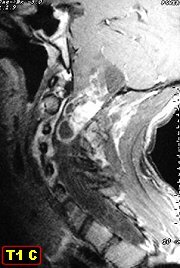 Lateral meningoceles of thoracic and sacral regions, marked kyphoscoliosis, cutaneous neurofibromas. 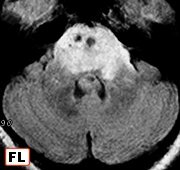 F. 51 yr. NF2. 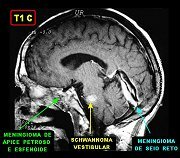 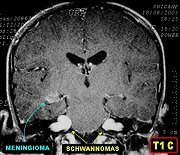 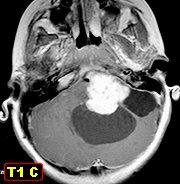 Multiple meningiomas (meningiomatosis), left vestibular schwannoma , ependymoma of spinobulbar transition. 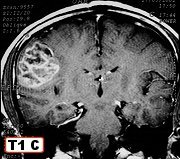 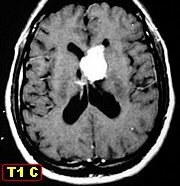 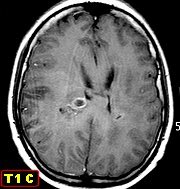 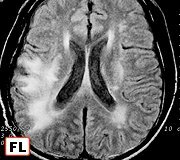 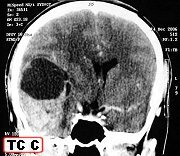 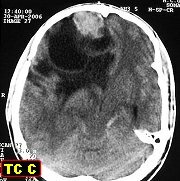 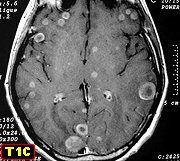 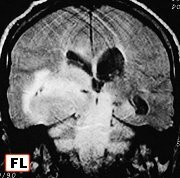 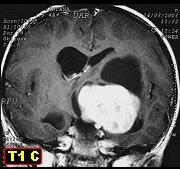 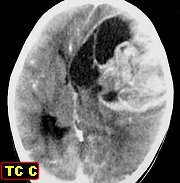 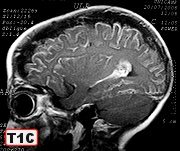 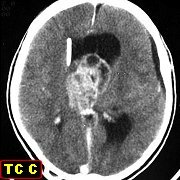 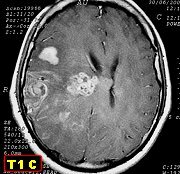 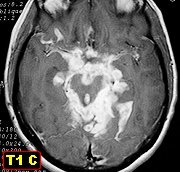 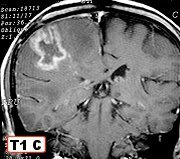 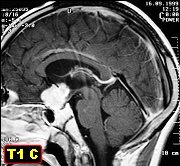 pilocytic astrocytomas (in English) . 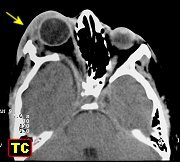 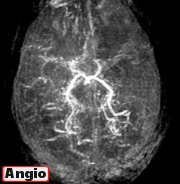 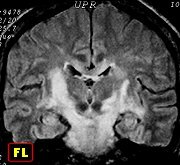 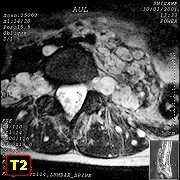 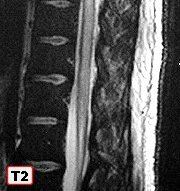 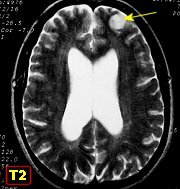 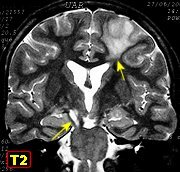 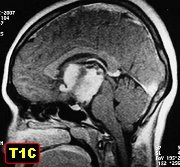 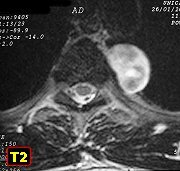 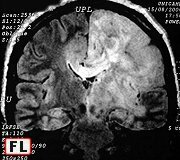 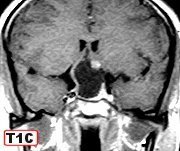 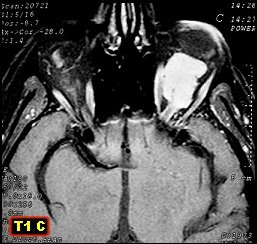 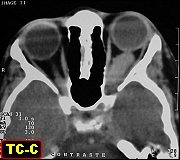 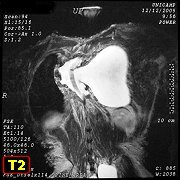 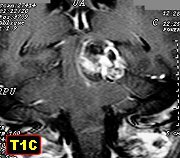 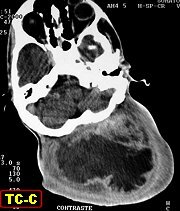 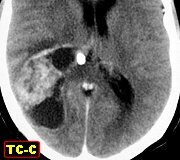 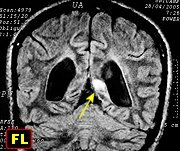 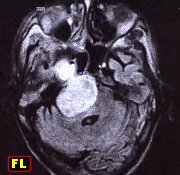 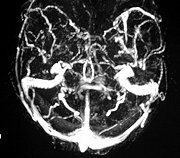 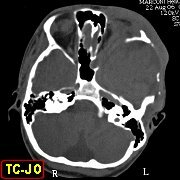 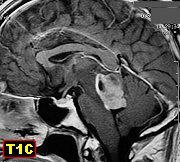 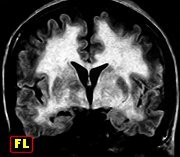 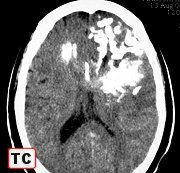 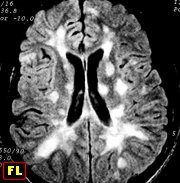 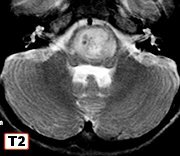 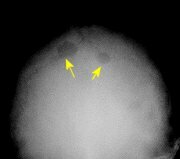 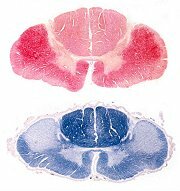 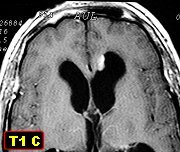 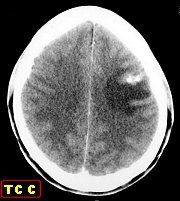 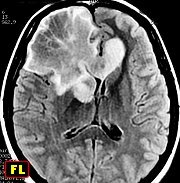 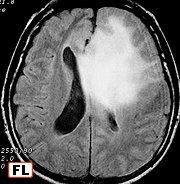 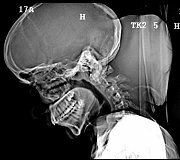 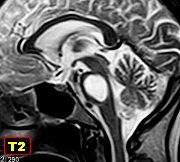 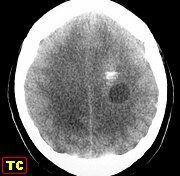 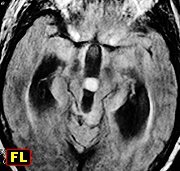 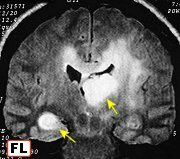 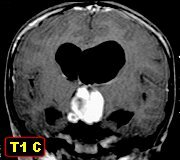 Early CT, 6/2004 Same, focus of annular enhancement in right hemisphere. 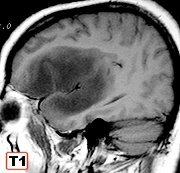 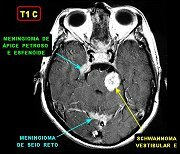 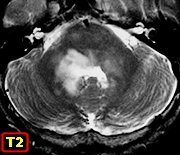 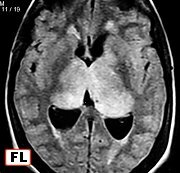 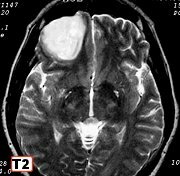 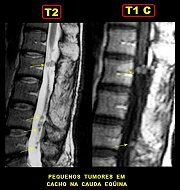 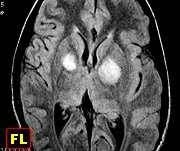 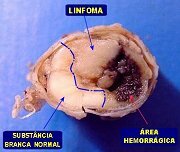 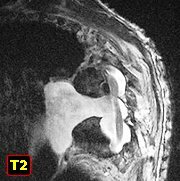 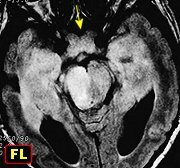 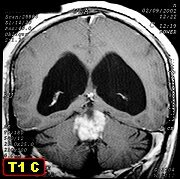 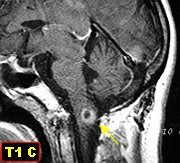 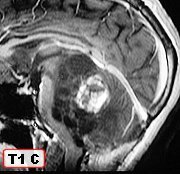 MRI 4/2006 Same after two months: tumor dissemination in right hemisphere.